Atlantic Cycles has been serving the Rehoboth Beach and Lewes area under the same management since 1998 . Year after year, our customers have enjoyed renting clean, top-quality bicycles from our two convenient locations. In order to better serve our growing number of rental customers, we stopped selling bikes and offering repairs. Nonetheless, our staff is always ready to help you get exactly the new bike or repairs you need from our local bike shop friends. 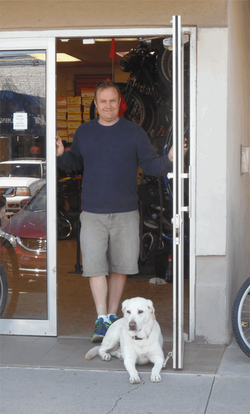 A favorite attraction at Atlantic Cycles is the Wilmington Avenue's store mascot, Chelsea the Bike Dog. Stop by and say "hi" to Chelsea but please don't feed her...she's trying to watch her girlish figure. We thank our many customers for your continued support. We look forward to the opportunity to continue serving you and seeing your families grow, year after year.